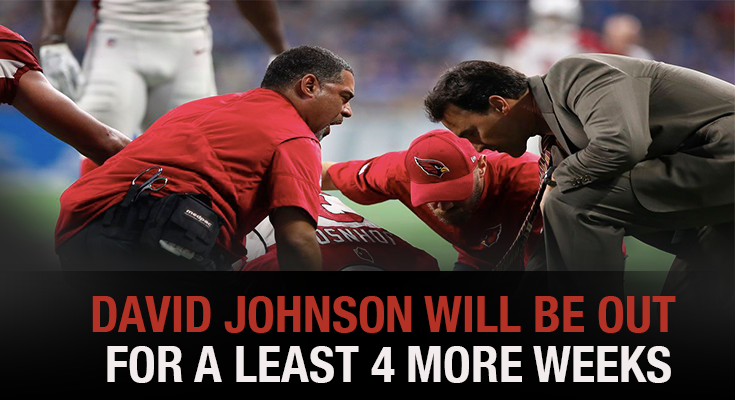 The young-back David Johnson was injured on the game between the Arizona Cardinals and the Detroit Lions. Last Monday, it was announced that the Cardinals will take a decision about the player’s future on the next 2 days. On 2015, the player was the third-round pick. He played for the first time with the Cardinals last season. Statistically talking, last season he marked 2,118 yards from scrimmage. That record help him earned the All-Pro honors. He also marked 20 touchdowns. Unfortunately, later a knee injury leave him out of the season. He recovered from that injury very fast, but now a wrist injury will take him out of the field for many weeks. That injury happened on the first week of the season when the player fumbled on an incredible carry even though his team lost with a terrible 35-23. The fans, the organization and many players are worried about the player’s condition. Many fans announced how worried they are about the situation via Twitter and other social media networks. That worried the head coach Bruce Arians who talked to the reporters on Monday. He explained how worried he was about the player’s injury and how much he wants him to recover as fast as possible. Many correspondents from ESPN and NFL Network explained the situation to the fans as easy as possible. They explained how much the player could be out of the field and how worrying is the situation. They compared the injury with the one T.J. Logan suffered months ago. Logan didn’t played for the team for 12 weeks because of the same injury. On Sunday, Johnson was replaced by Kerwynn Williams. Williams will continue replacing Johnson as he recovers. Another player that will be playing instead of Johnson is Andre Ellington.